A company has developed noncurable pressure-sensitive adhesives dispersed in three different solvents: ethyl acetate; 1,1,1, trichloroethane; and hexamethyldisiloxane. The dispersion is applied either to the skin or to the device. When the solvent evaporates, a tacky silicone layer is left behind, enabling its adhesion to another object through application of pressure. A curable, cross-linking PSA that cures to a solvent-resistant tacky coating is also available. Nusil Technology, 1050 Cindy Ln., Carpinteria, CA 93013. Phone: 805/684-8780. A line of conductive silver epoxy adhesives is used for bonding circuits, flat cables, and wave guides, as well as RF and EMI shielding. Tra-Duct 2902 is a two-part paste formulation made of refined pure silver and epoxy resin components free of any copper or carbon additives. The adhesives develop strong electrically conductive coatings and bonds between dissimilar materials, including metals, ceramics, glass, and plastic laminates. Their ability to cure at room temperature makes the adhesives suitable for cold soldering, a practical replacement for hot soldering of heat-sensitive components. The product comes in a kit for fast, easy mixing and dispensing or in premixed, frozen disposable cartridges. Tra-Con Inc., 45 Wiggins Ave., Bedford, MA 01730. Phone: 800/872-2661. 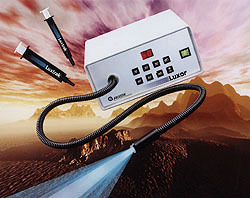 A line of optical-grade epoxies is suitable for bonding, coating, and encapsulating fiber-optic components. The adhesives can be used in the assembly or manufacture of medical devices, optical filters, LEDs, photo diodes, and lenses. Designed to maximize the optical and mechanical properties required in fiber-optic or optical use, the materials offer good adhesion, high-temperature properties, and chemical resistance. Epoxy Technology Inc., 14 Fortune Dr., Billerica, MA 01821. Phone: 800/227-2201. 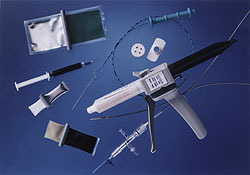 To compliment a line of UV-curable medical device adhesives, a company offers multigrade cyanoacrylates suitable for such difficult-to-bond materials as acetal, nylon, rubber, and nontransparent plastics. The Medi-Cure 220-series adhesive is USP Class VI compliant, has a thermal range of ­55° to 80°C, and offers shear strength up to 4200 psi, depending on the substrate. The company also manufactures a line of UV/visible light curing lamps and conveyor systems. Dymax Corp., 51 Greenwoods Rd., Torrington, CT 06790. Phone: 860/482-1010. 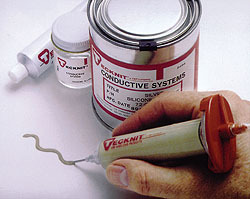 A two-component low-viscosity epoxy resin system is designed for bonding, sealing, and potting applications. The USP Class VI­compliant EP21LV system has a noncritical one-to-one mix ratio (by weight or volume) and can be cured at ambient or elevated temperatures. Physical strength properties can be adjusted by varying the mix ratio. A mix ratio of two parts resin to one part hardener optimizes strength, rigidity, and hardness, while a mix ratio of one part resin to two parts hardener enhances impact strength, toughness, and flexibility. The cured polymer system demonstrates good adhesion to similar and dissimilar substrates. Master Bond Inc., 154 Hobart St., Hackensack, NJ 07601. Phone: 201/343-8983. Conductive adhesives meet temperature range requirements from ­55 to 150°C and produce a bond that cures quickly at room temperature. After curing, the bond or seal is flexible, waterproof, and chemically resistant. The product's consistency and high conductivity enable optimum silk screening for engineering design applications. Shelf life is up to six months. One- and two-part adhesive sealants can be adapted to meet many bonding requirements. Tecknit, 129 Dermondy St., Cranford, NJ 07016. Phone: 908/272-5500. Silicone-based adhesives and heat-sink compounds are suitable for bonding microelectric components. The adhesives provide a wide range of thermal management interface media between components and heat sinks or substrates. Formulas operate up to 250°C without losing properties, drying, or hardening. Fujipoly, P.O. Box 679, Kenilworth, NJ 07033. Phone: 908/298-3850. 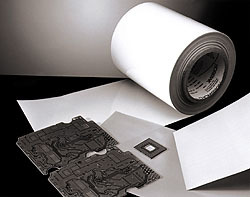 Thermally conductive tapes eliminate the need for liquid thermal grease and mechanical fasteners. Thermattach T413 and T414 double-sided tapes are designed to provide an effective thermal interface between components, ceramic hybrid circuits, PCBs, flexible circuits, and heat spreaders and sinks. The tapes are ionically clean and offer good thermal conductivity and bonding properties. T413 tape consists of a high-bond-strength, pressure-sensitive acrylic adhesive filled with alumina particles and applied to a fiberglass carrier. It provides good conformability to irregular mating surfaces and electrical isolation. T414 tape is similar except that the carrier is 0.001-in. Kapton MT thermally conductive polyimide film. Chomerics, div. of Parker Hannifin Corp., 77 Dragon Ct., Woburn, MA 01888. Phone: 617/935-4850. Tacky paste flux will not migrate and allows for easy component removal and replacement. 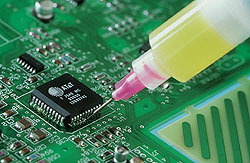 Unlike liquid flux, the high-viscosity paste flux can be applied in the exact location required for removal of a failed component and then used to hold the new part in place before soldering. Precise areas are easily covered, minimizing cleaning, reducing flux use, and increasing productivity of the repair and rework station. The flux is packaged in dispensable 10- and 25-g syringes as well as 150-g cartridges. ESP Inc., 14 Blackstone Valley Pl., Lincoln, RI 02865. Phone: 800/338-4353. 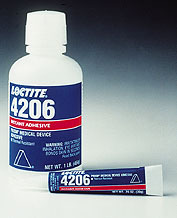 Flexible, photocurable adhesives are also free of solvents. Formulated for bonding, tacking, sealing, encapsulating, and potting applications, Luxtrak single-pack adhesives offer good adhesion to ABS, acrylic, PVC, and medical-grade plastics. 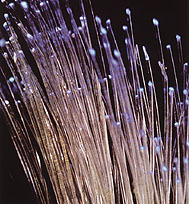 They feature "command cure" in seconds with UV or visible light. 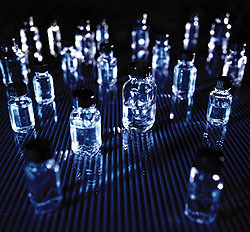 Use of light provides increased operator safety, greater depth of cure, and cure through UV-opaque substrates. Ablestik, 20021 Susana Rd., Rancho Dominguez, CA 90221. Phone: 310/764-4600. A one-part, medical-grade polyurethane adhesive is based on a fast crystallizing polyurethane resin. Tecoflex 1-MP can be used on such substrates as polyurethane, plasticized vinyls, polycarbonates, acrylics, chlorinated SBR rubbers, and primed metals. Also available are solution grades of Tecoflex and other polyurethane resins that can be dissolved in solvent systems to create custom adhesives for specific applications. Thermedics Inc., 470 Wildwood St., P.O. Box 2999, Woburn, MA 01888. Phone: 617/938-3786. Designed for medical device assembly applications, a low-viscosity cyanoacrylate adhesive achieves fixture strength within 20 seconds and delivers high impact and peel strength on hard-to-bond surfaces such as metal, plastics, elastomers, and lightweight devices. Prism 4206 withstands continuous exposure to temperatures up to 250°F and offers resistance to the rigors of gamma and EtO sterilization. Available in a variety of package sizes, the USP Class VI­compliant adhesive can be dispensed manually or with the manufacturer's semiautomatic and fully automatic dispensing equipment. Loctite Corp., 1001 Trout Brook Crossing, Rocky Hill, CT 06067. Phone: 800/571-5100.